There is a tradition of woodcarving in my birthplace that includes some of my favorite examples of church architecture. I come from England’s “West Country” and lived in the small village of Milverton in Somerset. Like many of the Norman churches in the area ours was built in the thirteenth century on a site that would have been a Saxon church. The carving in this church is fascinating—the many pew ends were carved from around 1500. These inspired me as a small boy and this is the place that is home to me. The decoration in the part of the world I come from was originally only in churches and cathedrals. It was later that the merchant class was able to afford ornamentation in their homes, so sacred carving is the history of my trade. Church wood carving was of particular interest to me because it often described the life of the people that carved the work both on the pew ends and in the misericords—and then one can imagine what the space would have looked like before pews were invented, when that church in Milverton would have been the village centre with reeds on the floor, where services, meetings, festivals, and dancing would have taken place. Part of a carved pew end, with Henry V’s coat of arms, Milverton, Somerset. Photo by Peter Tremain. In my work today I find that carving for a church project is even more exciting than working for a residence. It is always wonderful to have your work displayed in a public space—more commonly the carving done by our workshop is hidden away in private residences. It is also interesting to work with the community on projects that are very important to them and to consider the legacy that we will all leave behind. Therefore it is particularly important to produce work that will stand up to scrutiny—now and forever. Just because a carving has been produced by hand does not necessarily mean that the work is good. In addition, no matter what skills are brought to bear in a carving, it is equally as important that the carvers you employ have learnt to understand structure and movement, and that they take the opportunity to enhance the work with wit and ingenuity. If these skills are not shown in the final work, the result will look tired and lazy. Let me give you an example: Suppose we are presented with an eagle, sculpted in wood, with every feather neatly carved and a note below explaining that the work took 1,000 hours, but the sculpture has no movement. The wings extend out equally on each side and the pose is stiff and lifeless—what a waste of time and energy. Now compare that with an eagle clinging to the top of a wind blown tree, the body pushed back, one leg stretched forward, one wing open and pointing up, the other almost closed against the twisting body, head back, beak open wildly—but not a single feather carved—just crisply chopped out of the wood, the carving still showing the chisel marks, but not a single feather carved. That’s the difference. An artisan must show off skills that will impress fellow craftspeople and expect to be challenged and criticized. At the end of the day, the carver has to be able to stand by his work. It is important that you do not employ a craftsperson who can’t draw—if they can’t produce a decent drawing on paper to show the client, how can they expect to be able to carve that image in wood? Ultimately it is I who am, correctly, responsible for the work—not the designer. Note that I mention ‘design’—not workmanship. One should not allow poor workmanship in order to save time and money; instead budgets can be met by simplifying (or removing) decoration. It is important to note that simple decoration must be as well designed as more complex work. If carving, or any other decoration, is not “done right” it’s a waste of time, money, and materials, and therefore it would be better to have no decoration at all. By that I mean if decorative work is badly designed or executed, it looks ridiculous and actually detracts from the form that it is supposed to be enhancing. Additionally, a limited budget should have nothing to do with bad work. Of course no one should be asked to work for free, but the design can be simplified to meet the situation. By ‘simplified’ I mean that there is no situation in decoration where the frills can’t be reduced and still give the same feeling. In many cases simplifying can produce far better results—for example, when too much information is being crammed into a small space, or the carving will be placed at a distance where it will not be clearly seen and the scale is wrong. Simplification can also mean completely removing areas of design that are less important so that you can keep others in their full glory. Therefore there is never any excuse for design to be poor or work badly executed. Carved pre-manufactured products limit design choice, size and material. Or if machines have to be set up for a specific product, an original has to be created regardless, either by programming a computer or by creating a three-dimensional master, all requiring skill, time, and cost—particularly if the quantities are too low to offset this. A French panel with Acanthus leaf scrolls, roses, and fruit for a recent project by Agrell Architectural Carving. In the case of architectural decoration, machine-made mouldings create a rigid pattern so that where there are corners and returns the material is cut in unsuitable ways ruining the design; whereas when hand carving is employed each of the lengths can be laid out to fit the specific location. Other limitations of the machine are reflected in the poor quality of carving. Because a machine uses a spinning blade it is impossible to achieve those crisp flowing lines, “V” cuts, or undercutting. Timid moulding profiles are also required to allow the machine to reach these simple curves and the ruts left by the machine have to be heavily sanded out—all adding up to that cumbersome, robotic, jelly mould look. Instead, artisans and artists should be employed in every stage of the project. We normally work with architects both in our ecclesiastical and residential work. We also construct and install large projects from our wood shop in California and in association with shops in the UK and France, although we also collaborate with other wood shops around the country. When we carve figures we always use the skills of professional figure sculptors that specialize in the human form. These artists create a model for the client to review and for us to carve from. Carved wood screen, tabernacle and restorations at the Cathedral of the Madeleine, Salt Lake City, UT by Agrell Architectural Carving. 1. Look for artisans early in the process so that an understanding of cost and capabilities can be established and expectations met. 2. Invite input on general design and budget. 3. Be prepared to simplify. 4. Consider having a professional recruit and vet the artisans. 5. Don’t expect to find these skills on your doorstep; the tradition of the traveling craftsperson goes back thousands of years. 6. Check that they have the capacity to deliver on time and understand how to work alongside other tradesmen. 7. Be prepared to assist them with issues like insurance and contractual obligations. 8. Once you have a skilled craftsperson, employ them for the design details. 9. They are likely to be helpful in knowing people in the other trades that you need. 10. And most important—have good decoration or no decoration. If decoration is going to be used to enhance a religious space it should reflect the humanity and care of the craftspeople that produce it, together with the affection and love that the community shows for their place of worship. In 1981, Ian Agrell was elected to the Master Carvers Association, the oldest and most prestigious association of wood and stone ornamentation in the United Kingdom. Ian directs all projects as the principal at Agrell Architectural Carving, and also teaches at his School of Classical Carving. 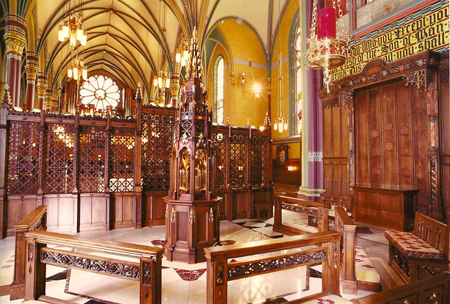 Agrell Architectural Carving has done many restoration projects in English parish churches; the organ case carving for Our Lady of the Angels, Worcester, MA; and the construction and decoration of the organ case for the Cathedral of Saint Paul, MN. He also constructed and carved a ‘throne’ and two side chairs for Pope John Paul II.